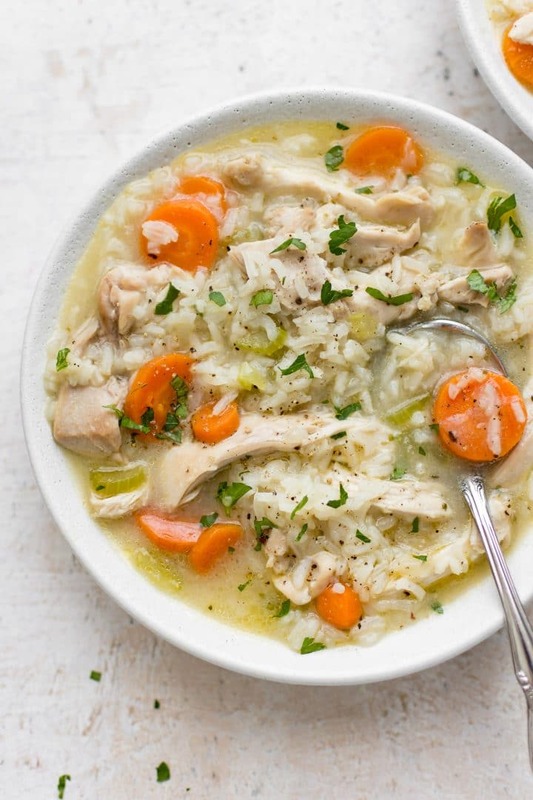 This chicken and rice soup recipe is healthy, delicious, and comforting! It’s ready in about 35 minutes. The perfect family meal. This is one of those soups that’s perfect when you’re wanting something that’s homey and satisfying. No fancy ingredients here. Just homemade comfort food. Luckily, we’re getting past cold and flu season now, but this is also perfect if you’re feeling under the weather or want to cheer up someone who is. 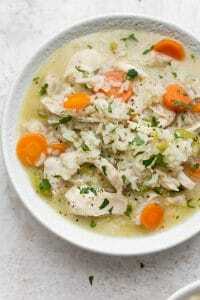 What cut of chicken to use in chicken and rice soup? I strongly suggest using chicken thighs. They’re more flavorful, and they’re also way more forgiving when it comes to not overcooking them. I use boneless/skinless ones because they’re easy, but you could definitely use bone-in ones and just remove the bones later. You can use chicken breasts if you wish, though. You could use rotisserie chicken, but then I recommend cutting the cooking time down a bit since the chicken is already cooked. What kind of rice to use in chicken and rice soup? I used white jasmine rice. White basmati would work too. You could use brown rice, but it will take longer to cook. Get it started: Prep your ingredients then sauté the onion and celery in olive oil. Add the remaining ingredients to the pot (garlic, carrots, chicken, chicken broth, Italian seasoning, and water). Cook for 15-20 minutes. The chicken will become fall-apart tender, the rice will thicken the soup, and the carrots will soften. Shred the chicken and season the soup as needed. Enjoy! Pro tip: The rice will soak up more of the liquid the longer you leave it. You may want to add more broth if you’re reheating it the next day. If you’re making the soup ahead of time, I suggest cooking it without the rice and adding the rice in before serving it. I like the way the rice releases starch and thickens the broth a bit. If, for whatever reason, the soup is a tad too thick for you, just add some more broth while cooking and it’ll thin out no problem. Love chicken soup? Try my chicken and mushroom soup, this Crockpot lemon chicken orzo soup, my chicken tortellini soup, or this creamy chicken gnocchi soup. 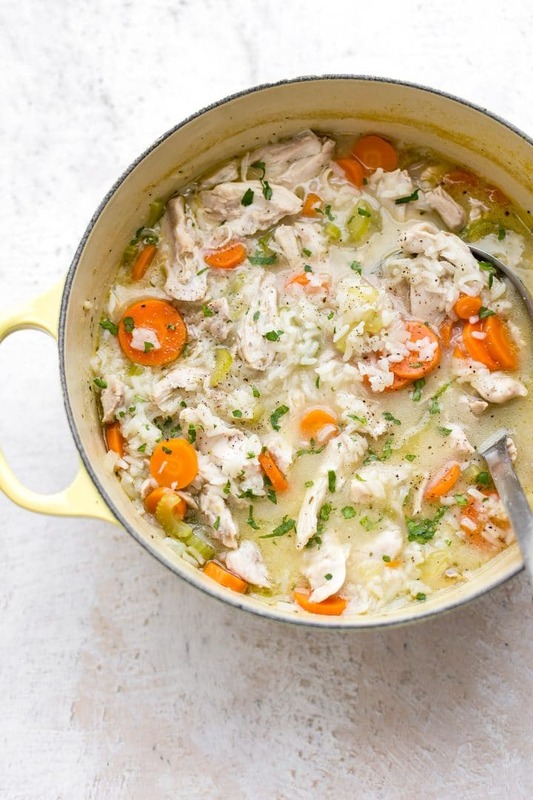 Will you make this easy chicken and rice soup recipe? 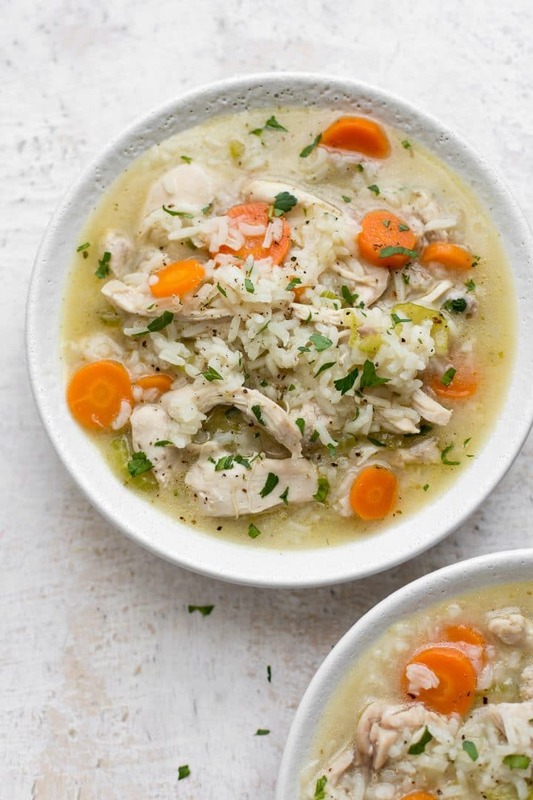 This chicken and rice soup recipe is healthy, delicious, and comforting! It's ready in about 35 minutes. The perfect family meal. Prep your onion, celery, and carrots. Add the oil, onion, and celery to a soup pot over medium-high heat. Sauté for 5 minutes. Add the chicken thighs, carrots, chicken broth, Italian seasoning, and rice to the pot. Increase the heat to high and bring the soup to a boil. Once boiling, reduce the heat so the soup's gently boiling. Give it a good stir to ensure the rice isn't sticking to the bottom. Continue simmering for 15-20 minutes or until the chicken is cooked through and the carrots have softened. Keep in mind the longer you cook the soup, the mushier the rice will get. Take the chicken out of the pot and shred it or cut it up prior to serving. Add it back in and then season the soup with salt & pepper as needed. I used about 1.5 pounds of chicken in this recipe. Anywhere from 1-2 pounds should work fine (you don't have to use 6 chicken thighs, but I just buy them in packs of 6). I love to sprinkle fresh chopped parsley on just prior to serving.